LONDON – While the rest of the world recovers from the Great Recession of 2008-2009, Europe is stagnating. Eurozone growth is expected to be 1.7% next year. What can be done about it? One solution is a weaker euro. Earlier this month, the chief executive of Airbus called for drastic action to reduce the value of the euro against the dollar by about 10%, from a “crazy” $1.35 to between $1.20 and $1.25. The European Central Bank cut its deposit rates from 0 to -0.1%, effectively charging banks to keep money at the Central Bank. But these measures had little effect on foreign-exchange markets. But the ECB’s inaction is not wholly responsible for the appreciation of the euro’s exchange rate. The pattern of current-account imbalances across the eurozone also plays a large role. Germany’s current-account surplus – the largest in the eurozone – is not a new phenomenon. It has existed since the 1980s, falling only during reunification, when intensive construction investment in the former East Germany more than absorbed the country’s savings. The external surplus has grown especially rapidly since the early 2000s. Today, it remains close to its pre-crisis 2007 level, at 7.4% of GDP. Now, however, previously deficit-stricken countries are moving into surplus, which means that the eurozone’s current account is increasingly positive; indeed, the eurozone-wide surplus is now expected to be 2.25% of GDP this year and next. The eurozone is saving more than it is investing, or, equivalently, exporting more than it is importing. This is strengthening its currency. Back in October 2013, the US Treasury pointed the finger at Germany’s structural surplus as the source of Europe’s woes. Its argument was that if one country runs a surplus, another must run a deficit, because the excess savings/exports of the surplus country must be absorbed by another country as investment, consumption, or imports. If the surplus country takes no steps to reduce its surplus – for example, by increasing its domestic investment and consumption – the only way the deficit country can reduce its deficit is by cutting its own investment and consumption. But this would produce a “bad” equilibrium, achieved by stagnation. Something like this seems to have happened in the eurozone. Germany has retained its “good” surplus, whereas the Mediterranean countries slashed their deficits by cutting investment, consumption, and imports. Greece’s unemployment rate soared to nearly 27%; Spain’s is almost as high; and Portugal faces a banking crisis. But Germany rejected this logic. Its current-account surplus was its just reward for hard work. Indeed, according to the German finance ministry, the surplus is “no cause for concern, neither for Germany, nor for the eurozone, or the global economy.” Because no “correction” was needed, it was up to the deficit countries to adjust by tightening their belts. John Maynard Keynes pointed out the deflationary consequence of this attitude in 1941. Deficit countries with a fixed exchange rate (as is the case in the eurozone) are forced to cut their spending, while surplus countries are under no equivalent pressure to increase theirs. Keynes’s proposed solution to this problem was an international payments system that would force symmetric adjustment on both surplus and deficit countries. Persistent surpluses and deficits would be taxed at an escalating rate. His plan was rejected. Of course, a creditor country can always help a debtor by investing its surplus there. Germany is willing to do this in principle, but insists that austerity must come first. The problem is that stagnation ruins investment prospects. China has shown that voluntary adjustment by a surplus country is possible. Until recently, the global imbalances problem was centered on China’s bilateral surplus with the US. China used its excess savings to buy US Treasury bonds, which drove down world interest rates and enabled cheap borrowing, permitting America to run a vast current-account deficit. The main impact of low interest rates, however, was to fuel the housing bubble that burst in 2007, leading directly to the 2008 financial crisis. Since then, China has made great efforts to reduce its external surplus. At its peak of 10.1% of GDP in 2007, the surplus was larger than Germany’s; by the end of 2013, it had plummeted to 2% of GDP. Why was China willing to adjust while Germany would not? Perhaps a key difference lies in the fact that Germany has significant political clout over the deficit countries with which it trades. Germany was effectively able to force austerity upon its neighbors. That raises an important issue regarding the legitimacy of austerity. Its main proponents are creditors, who have much to gain from it (relative to the alternative of raising domestic wages and forgiving debts). Creditor-debtor conflicts have always been the stuff of monetary politics, and the persistence of austerity has set the stage for a new debtors’ revolt. So we will have to rely on Draghi and quantitative easing to save the euro from Germany. Money will have to fall from the proverbial helicopter before Germany shows any willingness to reduce its surplus. The Fed's ad hoc departures from rule-based monetary policy has hurt the economy. 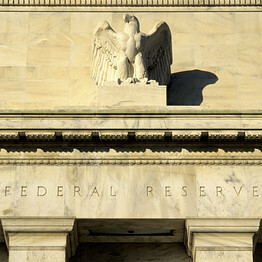 In a Wall Street Journal op-ed on July 18 called "An Unnecessary Fix for the Fed," economist Alan Blinder takes aim at legislation now under consideration in the House of Representatives to amend the Federal Reserve Act. Mr. Blinder focuses on what he calls the "meat-and-potatoes" of H.R. 5018: Section 2, Requirements for Policy Rules for the Federal Open Market Committee, which would require the Fed to submit to the Congress and the American people its rule or strategy for monetary policy. But Mr. Blinder actually shoots at a straw man of his own making, not at the proposed law itself. Mr. Blinder's main argument is that the legislation "seeks to intrude on the Fed's ability to conduct an independent monetary policy, free of political interference." I anticipated and refuted this argument in a July 16 Journal op-ed, "How to Spark Another 'Great Moderation.' " As I stated there, the legislation is very clear that "the Fed, not Congress, would choose the rule and how to describe it," and "since the Fed chooses its own rule, its independence is maintained." Nevertheless, Mr. Blinder still tries to press his lost-independence argument. He points out that the bill specifies a certain "Reference Policy Rule" with which the Fed would have to compare its policy rule. He notes that the reference rule is actually the Taylor rule (based on a proposal I made in 1992, a point I also made in the July 16 op-ed). But the legislation does not require that the Fed follow the reference rule or any other specific rule. It simply requires that the Fed compare its rule with the reference rule. Mr. Blinder claims that "In a town like Washington, the message to the Fed would be clear: Depart from the original Taylor rule at your own peril." That's nonsense. People at the Fed—as well as in academia and markets around the world—routinely compare monetary policy proposals with that rule. Federal Reserve Chair Janet Yellen gave a speech in 2012 comparing a policy rule she was considering for the Fed with the Taylor rule. There is no creation of a "holy writ" in this legislation, as Mr. Blinder would have us believe. He argues that if the legislation were passed, the Fed would simply "concoct" and "pretend" to follow a rule in a nontransparent way to get around the law. But even if the Fed staff could fool a few people with such tactics, it would not be for long, and I doubt that the Fed's experienced and dedicated professionals would go the way he suggests. Mr. Blinder says that the reference rule is "sensible" for normal times, but he argues—echoing Ms. Yellen—that these are not normal times. Indeed, much of his op-ed is devoted to making a list of what he sees as problems with the reference rule in the current situation, even though such a list is irrelevant to the case he is making because the legislation does not require that the Fed follow that rule. He calculates that the reference rule would now call for a federal funds rate at 1.25%, and he sounds a false alarm that this is "vastly higher than the actual near zero rate." But the legislation does not say that the Fed should increase the interest rate immediately, and if the Fed should decide to do so, it could go there slowly and with lots of warning. Mr. Blinder also claims that the reference rule does not work when the interest rate hits zero. The recommended procedure in the case of the Taylor rule has always been to keep money growth from falling when the interest-rate target hit zero. There is nothing unworkable about that. But the reference rule would not have been used as a rationale for the extended bouts of quantitative easing, including the highly questionable QE3. Some of Mr. Blinder's other arguments against the bill dredge up old long-discredited arguments against rules-based policy in general. He claims that a policy rule "forces monetary policy to respond . . . mechanically in ways that can be programmed into a computer," going so far as to say that "a handheld computer would do." Historians and statisticians who have found that periods of rules-based monetary policy work well do not base their findings on such mechanical characterizations of rules-based policy. There is nothing inherently mechanical about having a strategy or clearly stated method for achieving particular goals. In my view, it is the Fed's repeatedly interventionist and ad hoc actions in the past few years that are knee-jerk and mechanical. Mr. Blinder says that Fed policy has been working well, so a fix is unnecessary. But it has not been working well. Since the time the Fed deviated from the rules-based policy that had worked well in the 1980s and 1990s, we have had a financial crisis, a deep recession and a very disappointing recovery. The deviation from its previous rules-based policy in 2003-05, when it held its interest-rate target very low, helped create the boom and bust and can be traced to this poor performance. The purpose of the House bill is to prevent such harmful departures from rules-based policies in the future. The de jure independence that the Congress has granted the Fed has not prevented such deviations. Moreover, there is a clear precedent for such congressional oversight. During another period of poor performance in the late 1970s, the Federal Reserve Act was amended to require that the Fed report the ranges for the future growth of the money supply. These requirements were removed from the law in 2000. The requirements did not reduce Fed's independence, though the Fed complained about the legislation. In fact many judge that the 1980s and 1990s were a time when the Fed regained its de facto independence. That could well happen again if Section 2 of H.R. 5018 were passed into law. Mr. Taylor, a professor of economics at Stanford University and a senior fellow at the Hoover Institution, served as Treasury undersecretary for international affairs from 2001 to 2005. ONE trillion dollars. That may be the cost to Russian investors of Vladimir Putin’s rule. It is the equivalent of about $7,000 for every Russian citizen. The calculation stems from the fact that investors regard Russian assets with suspicion. As a result, Russian stocks trade on a huge discount to much of the rest of the world, with an average price-earnings ratio (p/e) of just 5.2. At present, the Russian market has a total value of $735 billion. 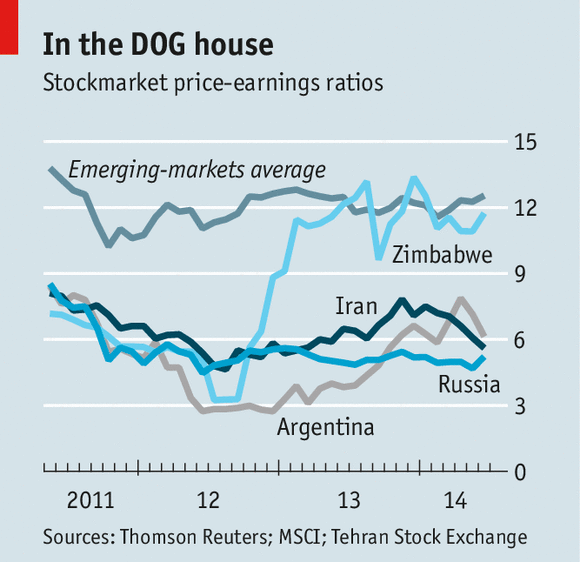 If it traded on the same p/e as the average emerging market (12.5), it would be worth around $1.77 trillion. Not all of this discount is down to the actions of the Russian government. But it is probably responsible for the bulk of it. Investors have been nervous about corporate governance in Russia, thanks to a series of high-profile incidents such as the jailing of Mikhail Khodorkovsky, an oil magnate who fell out with Mr Putin, the expulsion of William Browder, a hedge-fund manager who campaigned against corruption, and the trouble faced by oil companies such as BP and Shell in dealing with local partners. All those events occurred well before Russia’s annexation of Crimea and its backing of separatists in eastern Ukraine, steps that have prompted Western sanctions. Most Russian citizens will not notice the problem since they do not own stocks individually or collectively, in the form of pension schemes and mutual funds. (By itself, one might argue, this is an indictment of the regime.) But it will hurt the many oligarchs who are close to Mr Putin. And for the broader population, the result is a lack of foreign investment (and capital flight abroad) that must be contributing to the country’s poor growth: its GDP fell by 0.4% in the first quarter. From time to time, analysts point to the low Russian valuation as a sign that the market is cheap and that international investors should go on a buying spree. But such calls tend to be swiftly followed by new evidence of the Putin regime’s caprice, prompting further disillusionment. The low rating of the market has been remarkably persistent (see chart). At the global level, investors have learned to shrug off geopolitical risk. Ever since the first Gulf war of 1991, when markets rallied as soon as the fighting started, the pattern has been the same. Markets may wobble for a few days over wars, or rumours of wars. But no recent crisis has resulted in anything more than a regional conflict, nor has any resulted in the kind of economic disruption that occurred in the 1970s, when soaring oil prices fostered stagflation. Indeed, investors seem to have great faith that most problems can be solved by central banks, either in the form of near-zero interest rates or bond-buying programmes. Yet the same is not true at the level of individual countries, where political risk still clearly applies. Several other countries show evidence of what might be dubbed the “DOG factor”: a discount for obnoxious governments. Iran, like Russia a target of Western sanctions, trades on a p/e of just 5.6 and has a total stockmarket value of $131 billion; were it to be rated on a par with the average emerging market, its market value would be $292 billion, so its DOG factor is $161 billion or 55%. The stockmarket is not the only way that investors penalise untrustworthy governments; Argentina’s 20-year bonds yield 9.8%, more than five percentage points above the yield on the equivalent Mexican bonds. (Russia cancelled a bond auction this week, citing “market conditions”.) The more the government spends on interest, the more it has to tax its citizens and the less money it has available to spend on services. The bond-market vigilantes may have been neutered in the developed world by central banks and their quantitative-easing programmes, but they are still capable of inflicting damage in emerging markets. Many people in the affected countries see these discounts as proof of Western bias or a sign of the malign impact of international capitalism. But the acid test is what they would do with their own money: would they trust their government enough to keep it at home, or would they rather send it abroad?